Since 1994, the Department of Justice’s Office of Community Oriented Policing Services has doled out more than $14 billion in funding to thousands of police agencies around the country in an effort to improve the way law enforcement officers interact with the constituents they are sworn to protect. Yet 20 years after Bill Clinton instructed his Justice Department to create a special program dedicated to advancing the principles of community policing, stories of citizens (most of them minority men) dying in police custody are rarely far from the headlines. While data on police misconduct is notoriously hard to pin down, that which is available suggests federal efforts to make police more responsive to community interests have had only limited impact on the street. And they’ve done nothing to increase the average American’s trust in police – which, according to a Gallup poll, was at the same level last year even before Ferguson that it was the year COPS was launched. Despite measurable reductions in violent crime, citizen complaints of police misconduct rose by double digits between 2002 and 2006, according to data gathered by the Bureau of Justice Statistics (BJS), and more of these complaints were substantiated than in previous years. Over the same period COPS hiring grants put thousands of new officers on the street. Assuming the problem with police behavior is limited to “a few bad apples,” it’s safe to say COPS programs haven’t done a terribly good job cleaning out the orchard. Indeed four of the cities where the most controversial police killings have occurred since November – Cleveland, Tulsa, Charlestown, S.C., and Baltimore – have benefitted from millions in COPS grants over the years. Between 2011 and 2013, the police department in Cleveland alone received more than $7 million to put more officers on the street. Unfortunately one of them happened to be Timothy Loehmann – who shot and killed 12-year old Tamir Rice last November for sitting on a park bench holding a BB gun (it’s worth mentioning here that Ohio is an open-carry state). Loehmann had been fired from his previous job as a police officer in a neighboring city for poor performance and had reportedly failed to secure employment at four other law enforcement agencies before Cleveland PD picked him up in early 2014. Like most large U.S. municipalities, Cleveland has had a community policing program in place in one form or another since the 1990s. One could be forgiven for questioning whether the money spent propping up those efforts hasn’t amounted to a big waste of taxpayer dollars (and indeed Republican lawmakers have been doing just that in recent years). But Cleveland’s failure shouldn’t be viewed as an indictment of community policing, or even the COPS office itself – which has hosted a succession of leaders who seem genuinely interested in reforming police practice. Rather it underscores the difficultly of turning principle into practice, and the extent to which the theories that gave rise to the COPS office have been tainted by the war on drugs, police militarization and a culture of mass incarceration. It should also serve as a cautionary tale for the many prominent federal, state and local officials who have hitched their carts to community policing as the best solution to the current crisis in law enforcement without a complete understanding of what the term means. Conversations with police leaders, community activists and academics – many of whom helped formalize modern American community policing in the 1970s and 1980s – reveal an approach to community policing that is all too often fundamentally at odds with the philosophy as it was envisioned. All remain true believers in the model’s ability to revolutionize policing in America, but they say before that can happen we need to have a conscientious public discussion on what community policing is, and what it isn’t. While progressive police chiefs were experimenting with community-based policing since at least the 1960s, the theory flourished in the 1980s under the guidance of Michigan State University criminologist Robert Trojanowicz. Trojanowicz conducted studies of early foot patrol experiments in the nearby cities of Flint and East Lansing and found increased levels of satisfaction among both community members and officers. In 1983 he established the National Center for Community Policing (NCCP) and began exploring the concept of policing as an immersion profession in which the enforcement of law is only one component. “Community Officers are part of the community, generalists who do whatever it takes to help people help themselves,” he wrote. 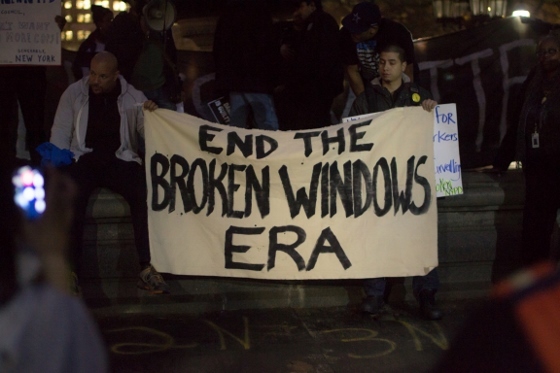 By the early nineties Trojanowicz’s belief that police should be “social workers with a gun” ran headlong into a competing concept of policing known as “broken windows” theory – which came to prominence during the same period and – in its most recognizable form – posits that enforcement of minor quality-of-life violations helps reduce serious crime and leads to positive community outcomes. Trojanowicz died suddenly in 1994 at the age of 52 before he could see how that clash played out. But Bucqueroux – who now teaches journalism at MSU – blames broken windows theory and its influence on the “arrest first” approach championed by Clinton-era COPS officials for “destroying” community policing. (Her 2014 article titled “11 Reasons Community Policing Died” is a must read for anyone interested in wrapping their heads around how things got so bad). Bucqueroux says that since its inception the COPS program has been unable to shake the influence of the zero-tolerance “tough on crime” ethos that influenced criminal justice policy in the 1990s. David Couper, who spent two decades as the Chief of Police of Madison, Wisconsin, and now runs the blog Improving Police, articulated this dichotomy in an interview in March following the release of the DOJ report on the Ferguson Police Department (which stretched broken windows to its ignoble conclusion). Couper was an early pioneer of what he calls “neighborhood policing,” and by the time he retired from leading the MPD in 1993 he had established a legacy of effective community policing that exists to this day. A vocal critic of the way community policing has been misapplied, he calls the COPS program, “a multi-year charade” that has failed to change the dominant style of policing despite the appearance of widespread buy-in. He doesn’t blame the DOJ for failing at its mission, but rather implies the mission was doomed from the start without thousands of forward-thinking chiefs across America with the political will to serve as its foot-soldiers. Minus that will to change, Trojanowicz’s pioneering theories of community empowerment and decentralization became supplanted by a repackaged version of the very ethos he had set out to change. His ten principles still turn up in COPS instructional documents on community policing; but in practice they are now bundled into the three-pronged approach to community oriented policing advanced by the DOJ: Organizational Transformation, Community Partnerships and Problem Solving. Much of what currently ails many community policing programs can be attributed to an over-emphasis on the latter of these elements – which is given equal footing with trust-building initiatives despite making up just ten percent of Trojanowicz’s original community policing platform. Almost universally police departments gauge the success of their COP efforts on how well they solve the problem of crime as evidenced in quarterly crime statistics. It’s hard to blame them. “Trust” and “transformation” are considerably hard to measure quantitatively, whereas crime figures are a simple matter of math. The idea that successful community policing is more about political will than it is about money is a theme that comes up regularly when talking to the theory’s early architects. Many say a lack of the former and an abundance of the latter has led to a considerable amount of waste and abuse over the years. My own discussions with police officials and researchers have revealed a host of strategic initiatives – some active, others defunct – that have been erroneously lumped under the umbrella of community policing. These range from giving out free hot dogs at monthly community picnics to flooding a high-crime area with patrol officers who are instructed to enforce every code violation they encounter. Other departments assign officers to a localized foot patrol only to rotate them out after six months, negating the ownership factor that unpins so much of true community policing. More often departments dance between “Officer Friendly” style engagement practices and militaristic enforcement campaigns while missing the point that the sweet spot of community policing falls in between. If you religiously cite every person drinking a beer in the park on a hot summer night for public drinking, they’re probably not going to tell you who did the shooting you’re investigating no matter how many hot dogs you feed them. Perhaps the most well-known version of bastardized community policing – stop-and-frisk – has not only alienated entire communities but has proven completely ineffective as a blunt-force crime-fighting strategy as well. By contrast to these approaches, experts say true community policing efforts incorporate strategies that are designed to improve public safety by eliciting the input of stakeholders and responding to a neighborhood’s unique cultural and socio-economic dynamics. Academics call this “passive engagement,” and it is most effectively practiced without a summons book. In Madison under Couper that meant decriminalizing possession of small amounts marijuana long before that was a thing; in New York it would have meant asking Eric Garner to please take his loose cigarette business down the street and away from stores instead of choking him out on the street. For Bucqueroux it means considering giving drug dealers the leeway to ply their trade inside if it means keeping them off the street where kids are playing. The notion that discretionary policing, long-term beats that give officers ownership over their patrol areas, cultural competence, and genuine responsiveness to community concerns leads to stronger citizen-police ties is hardly a new idea. Unfortunately any enduring progress toward that goal over the past two decades has been blocked by a decades long law enforcement paradigm (intricately tied to the war on drugs) that has literally divided police and many of the communities they serve into separate enemy camps. Andrea Schneider – a former COPS office researcher who spent years studying the program’s effectiveness – says reversing that level of damage will be a formidable undertaking. It’s not enough for a chief to create silos of community policing while the remainder of their department conducts business as usual, she explains. But she says facilitating the kind of cultural transformation needed to affect authentic community policing will mean turning decades of law enforcement practice on its head. It’s hard to argue with the validity of that. But there are roughly 18,000 state and local police forces in America bound by no single national mandate. That means Davis and his staff are forced to rely on a combination of financial incentives, policy and practice recommendations, and blind faith to coax departments into the community policing fold (at least until the inevitable crisis elicits a settlement agreement). There’s no doubt that money talks; but it also walks – sometimes into the sunset. The DOJ has struggled since the very beginning of the COPS program to ensure grant money is used for its stated mission. Since 1997 it has resolved nearly 4,800 compliance issues involving over 3,000 grantees. Government Accountability Office reports from the 1990s and early 2000s reflect a stubborn habit among grantees to use COPS funds to supplant rather than supplement local spending, in violation of grant terms. The DOJ has gotten better at addressing supplanting, but it still has a hard time getting grantees to use their funding for actual community policing – a task made all the more difficult by the fluid definition of the term itself. As recently as 2013, the GAO estimated that less than 20 percent of the applications funded under the COPS Hiring Program contained evidence showing how additional officers would be deployed in community policing. At the behest of its Inspector General the DOJ has been taking pains to improve accountability. Last year it revamped parts of its Grant Monitoring Standards and Guidelines for Hiring and Redeployment for the first time since 2004, with an eye towards improving compliance. What’s still missing are adequate metrics for gauging an individual program’s success, or even a consensus on what success looks like. With the entire nation focused on improving police-community relationships, police departments will need to find something more enduring than crime stats to show they’re making progress. They might consider starting with citizen complaint totals. When it comes to human sentiment, it might be hard to gauge when you’re doing something right, but when you’re doing something wrong the world will usually find a way to let you know. Guest contributor Christopher Moraff writes on criminal justice policy, policing, and civil liberties for Al Jazeera America and NextCity.org. Find more of his work here.